What is the Workflow Hub? With the release of KNIME Server 4.8 we included two functionalities that are available as previews. That means that the functionality is not always feature complete, or subject to change. The previews are provided to allow you to test the functionality and provide feedback that will help to shape the final product. In case you have questions about any of the functionality in the previews please contact support@knime.com. The KNIME Server Workflow Hub Usage and Administration guide section covers in detail the options for the configuration and usage of the KNIME Server Workflow Hub — or Workflow Hub for short. If you are looking to install the KNIME Server you should first consult the KNIME Server Installation Quickstart Guide. For guides on connecting to the KNIME Server from the KNIME Analytics Platform, or using the KNIME WebPortal please refer to the guides: KNIME Explorer User Guide, KNIME WebPortal User Guide. Since the Workflow Hub sits on top of the KNIME Server, please consult the KNIME Server Administration guide for help setting up and configuring the KNIME Server. The Workflow Hub is a feature of the KNIME Server, providing users an overview over the workflows stored on the server as well as more in depth workflow information, such as a workflow image, meta information and required plugins. Additionally, the Workflow Hub allows users to give a rating, assign tags and comment on a workflow. With the integrated workflow search users can find workflows by title, author and assigned tags. Since the Workflow Hub is integrated into the KNIME Server, it shows all workflows which are also visible in the WebPortal, taking into account user and group permissions. As soon as a workflow is uploaded to the KNIME Server instance running the Workflow Hub, the workflow is available there as well. The workflow metadata, such as the description, can be edited in the KNIME Analytics Platform. The workflow description is interpreted as Markdown, a text formatting language designed to be readable in parsed and non-parsed form. Please refer to the section "Markdown" for a brief introduction. The Workflow Hub lists snapshots of a workflow as versions on its details page. Once a user creates a snapshot, the workflow’s detail page shows a list of snapshots at the bottom of the right column, with version numbers and commit messages. Each snapshot can be accessed with an individual URL similar to the workflow details URL under: http://serveraddress/knime/hub/workflows/<workflow_path>/v<timestamp>, where <workflow_path> is the URL encoded path of the workflow and <timestamp> is the creation time of the snapshot as Unix timestamp, i.e. the number of seconds that passed since 1st of January 1970. 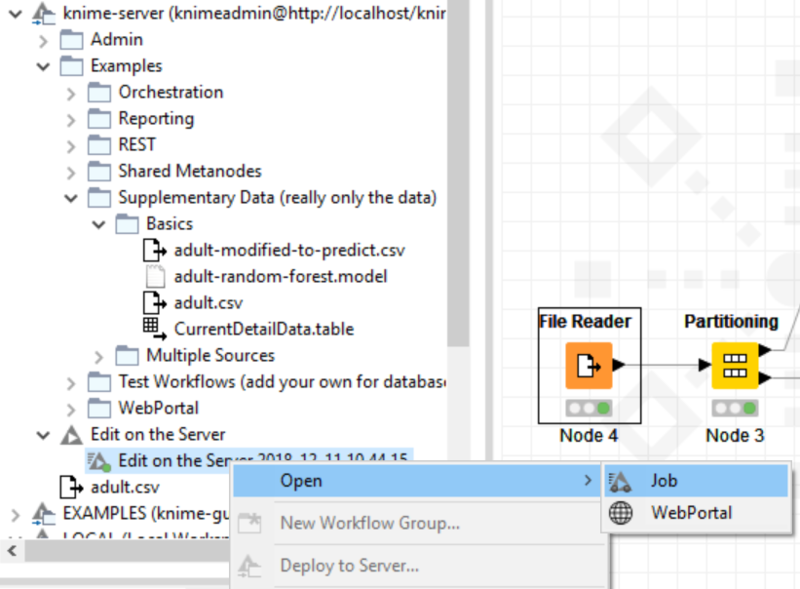 The URL http://serveraddress/knime/hub/workflows/My%20Workflows:Data%20Analysis/v1498651200 therefore points to a snapshot of the workflow "Data Analysis" in the workflow group "My Workflows" when the snapshot was created at the 28th of June 2017 at 12pm. Using the Workflow Hub, users can assign tags to workflows, rate workflows and write comments. All of those features are available on the workflow details page. Tags allow a flat categorization of workflows independently of the workflow group they are stored in. They can be assigned on a workflow’s details page in the right column. To change the tags, click on the blue pencil symbol and enter the tags in the text box. Multiple tags are separated by comma. A list of all assigned tags is shown on the index page, providing users quick access to workflows of interest. Workflow ratings allow users to give feedback regarding the quality of a workflow on the KNIME Server. A rating can be given on a workflow’s details page using the star symbols on the right side. Every user is allowed to rate a workflow only once. Subsequent ratings of the same user only change this user’s rating. Workflow comments are displayed below the workflow image on the workflow details page. The newest comment always appears on top of the list and new comments can be written in the text box above. Just like the workflow description, comments can be formatted in Markdown (see section "Markdown" for a brief introduction). Once a comment is submitted, it can be edited and deleted by the original author and any user with administrator privileges. The workflow search allows the searching the workflow repository by title, tags and author. The results depend on the read permissions the user has for the individual workflows or their workflow groups. To search for terms in the workflow title, the query can be entered verbatim in the search field. To search for a tag, the prefix "tag:" can be prepended to the query and to search for workflows of a certain author, the prefix "author:" can be used. When searching for a tag or author that contains spaces, the tag or author name can be put in double quotes. When providing multiple queries at once, all workflows that match all of the queries are returned. The following table lists and explains some queries. All workflows uploaded by user "testuser"
All workflows having the tag "analysis"
All workflows uploaded by user "Test User" and having the tag "Data Analysis"
All workflows containing the text "PMML" in the title and were uploaded by user "Test User"
The index page, the workflow details page and the pages containing legal information can be customized with HTML pages placed in the subdirectory "hub" in the extension directory of the KNIME Server installation, i.e. <server repository>/extensions/hub/<file>. The "hub" directory is watched by the server process and changes to the files are usually applied within a few seconds. Deletion of the files terms.html, copyright.html and imprint.html removes those entries also from the "Legal" section in the page footer. When all three files are deleted, the legal section of the footer is completely hidden. When the file terms.html is present, a note is displayed under the workflow download button, advising the user that by downloading the workflow they agree to the terms and conditions. The HTML files are embedded in the Workflow Hub pages and have access to the website’s stylesheets. The CSS framework used for styling is Bootstrap 3. The following table lists and explains the customization options. Please note that the custom content must be placed in files with the names as given in the table. This content is displayed at the top of the index page and can be a general welcome text. This content is displayed as the first tile of the index page, next to the most recent workflows. This content is displayed at the bottom of the right column of the workflow details page. This content is shown on the help page. This content is shown on the terms and conditions page. Linked from the footer. This content is shown on the copyright page. Linked from the footer. This content is shown on the imprint page. Linked from the footer. For formatting text in the workflow description and the comments the Workflow Hub uses Markdown. This language allows users to make text cursive or bold, add headers and lists or embed images from URLs. The following table explains some formatting options for Markdown. Additionally, paragraphs can be separated by a blank line and line breaks can be inserted by appending two spaces to a line. The KNIME Remote Workflow Editor enables users to investigate the status of jobs on the server. Whenever a workflow is executed on the KNIME Server, it is represented as a job on the server. 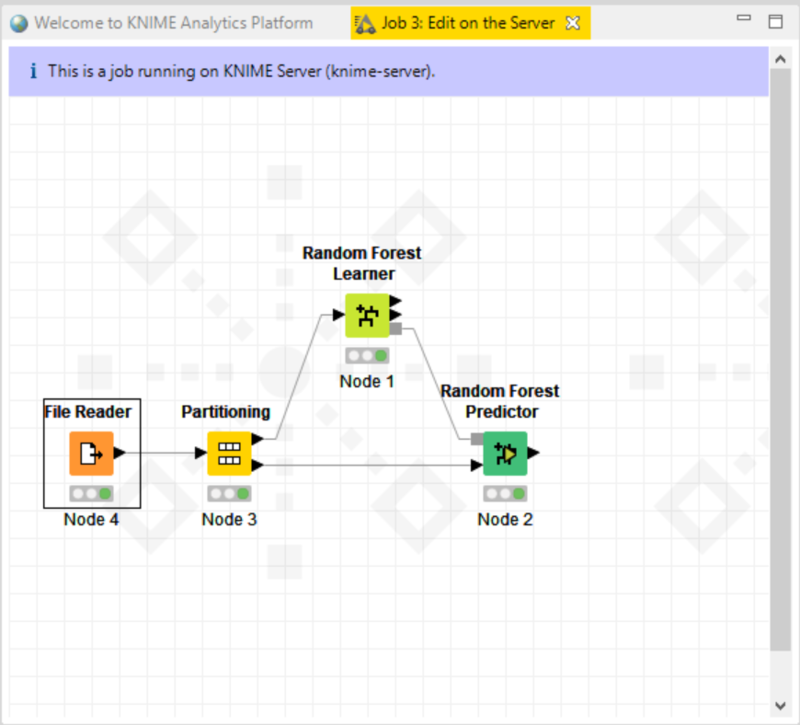 This instance of your workflow will be executed on the KNIME Server, which can be helpful in cases where the server hardware is more powerful than your local hardware, the network connection to external resources such as databases is faster, and does not require traversing firewalls/proxies. The Remote Workflow Editor looks just like your local workflow editor, apart from the fact that it is labelled and the canvas has a watermark to help identify that the workflow is running on the KNIME Server. Most of the edit functionality that you would expect from editing a workflow locally on your machine is possible. Notable cases where it’s not yet supported are: copying nodes from a local workflow to a remote workflow (and vice-versa), browse dialog for file reader/writer nodes browses the local filesystem rather than the remote filesystem. 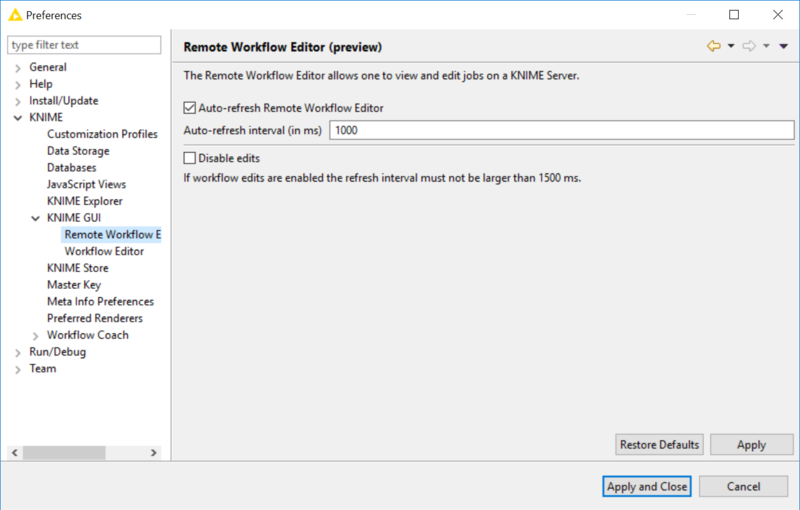 The Remote Workflow Editor is installed on the KNIME Analytics Platform as part of the KNIME Server Connector extension, and on the KNIME Server it must be installed into each executor. Detailed instructions are found below. The Remote Workflow Editor feature needs to be installed in the KNIME Analytics Platform. 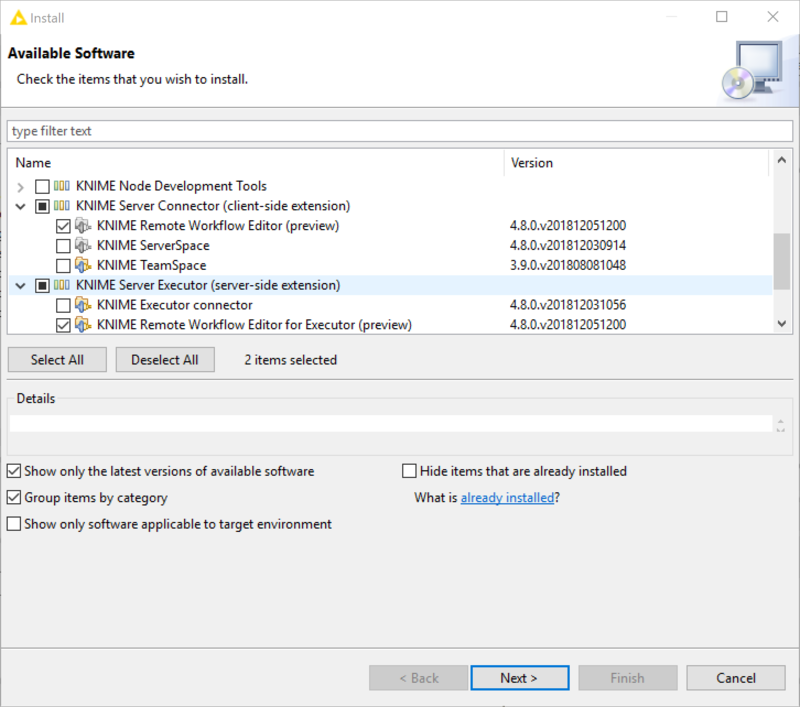 Choose File > Install KNIME Extensions, and then select "KNIME Remote Workflow Editor (preview)" from the "KNIME Server Connector (client-side extension)" category. All jobs (executed from Analytics Platform, or via WebPortal) can be viewed, meaning that it’s possible to see node execution progress, number of rows/columns generated, and any warning/error messages. 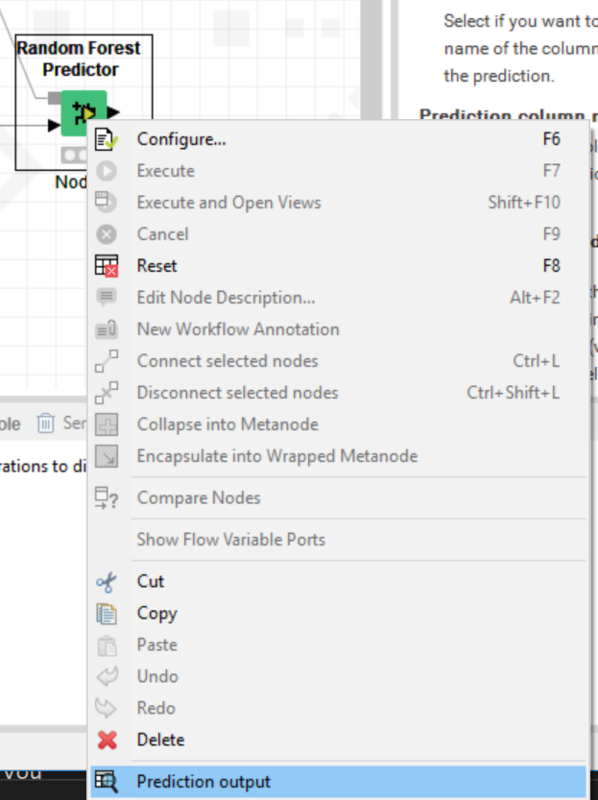 It’s also possible to view and edit configuration settings, of most nodes as you would if the workflow was on your local KNIME Analytics Platform. Currently it’s not supported to configure file paths in some file reader nodes. It’s also possible to move, add and remove nodes from the workbench, as you would for a local workflow. With the KNIME Server 4.8 release it’s possible to view data via the normal data view. The KNIME Remote Workflow Editor enables you to view and edit workflow jobs on the KNIME Server. Remote Workflow Editor preferences allow to change the auto-refresh interval, and also optionally to uncheck the 'Enable job edits' to enforce view only mode for all workflows. You will be able to see which nodes are currently executing, which are already executed, and which are queued to be the next in execution. You can see errors and warning in the workflow by mouseover on the respective sign. With future KNIME Server releases we will continue adding functionality to the KNIME Remote Workflow Editor. If you have any ideas or thoughts, we appreciate your input via support@knime.com.